Michelle Stanley, Flute - Integral Steps, an integrative education non-profit supporting the balanced development of individuals, families and communities, through music, movement, psychotherapy, ecology and creative arts! Colorado and Portland based! 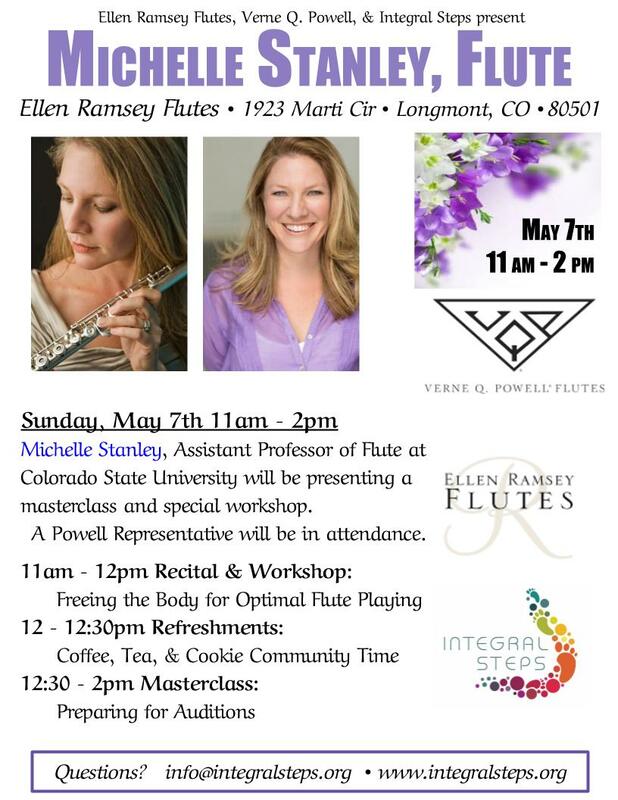 Colorado flutist, Michelle Stanley will be presenting a recital, workshop and masterclass on Sunday, May 7th! A Powell Representative will be in attendance. Special thanks to Verne Q. Powell Flutes and Ellen Ramsey Flutes. 1923 Marti Cir, Longmont, CO 80501. Note: All performance slots have been filled. If you are choosing to audit this class, you may answer "N/A" to the following questions, although all information is helpful! I agree to indemnify and hold harmless Integral Steps and Ellen Ramsey Flutes, its officers, employees, agents, consultants, subcontractors, insurers and representatives (collectively Integral Steps), for any loss, damage, or injury to myself or my property in any way related to my participation in Integral Steps' and Ellen Ramsey's programs. This release of Liability applies to me as well as any of my children, personal representatives, assigns, heirs, and next of kin. I authorize Integral Steps and Ellen Ramsey Flutes in a medical emergency to seek emergency medical assistance at my expense. I give permission to Integral Steps and Ellen Ramsey Flutes to use any photographs, videotape, or other media record of my participation in this event for any lawful purpose, without compensation.